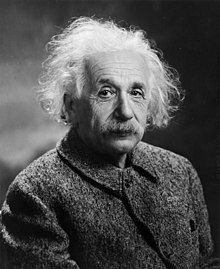 Albert Einstein was a German physicist. He is very well known for his ideas on space and time.These discoveries include Special and General Relativity. He also helped in the studies that led to the making of the nuclear bomb. Because of his fame, his image is used as a face for mad scientists. His last name has now been made a word many people use to call another smart. He is thought to be the most well known scientist. This page was last edited on 17 February 2008, at 01:45.